Are hot showers good for you? What’s the deal with stepping into the shower every morning and jacking the temperature up? We shower in hot water because it feels good, right? We shower in hot water because we live in a time where it’s easy accessible, and we don’t have to pummel ourselves with freezing cold water like cave men. However, whether or not hot showers are good for our body is a different question altogether. We recently wrote an article that highlights the benefits of cold showers; and now we’re looking at the flip-side of the argument. If cold showers are so good for us, that must make us question the pros and cons of hot showers. Is comfort the only thing hot showers have going for them, or is there more to it than that? This article outlines all the reasons why you should stop taking hot showers every morning, and maybe switch to cold showers or something in-between. Whilst your skin consists of 3 separate layers, hot showers affect the very most outer layer of your skin, the epidermis. Taking hot showers often damages your keratin cells, which are the cells that make up this layer of the skin. They exist to keep the moisture inside your skin, but exposure to heat can often damage the epidermis, and worsen the condition of your skin. For the same reason in which hot showers damage your skin; the layer of the skin responsible for keeping the moisture inside your skin is damaged. Which ends up leaving you with dry, cracked, rough skin. Hot water strips oils from the skin faster than warm water. Long showers can actually dry out your skin. Limit yourself to a single 5-10 minute warm shower a day, or take cold showers and improve the condition of your skin! Studies have shown that men who regularly take hot showers and baths are at higher risk of infertility. One particular study showed that when men with fertility problems stopped taking baths, 5 out of 11 noticed a dramatic increase in sperm count. Overheating your testes can be very bad for your sperm count and overall fertility. Actually, taking ice cold showers/baths can benefit fertility significantly. Sperm are known to develop best within a cool environment, which is why the difference between taking hot showers and taking cold showers, can make a huge difference to sperm health. Those keratin cells we were talking about earlier? They’re also responsible for protecting your hair. Hot water damages those cells, and can damage your hair cuticles. Which essentially means worse looking hair, and even hair loss if taken to a certain extent! Most people don’t wash their hair in hot enough water to damage their scalp and cause their hair follicles to weaken. However, sometimes people do, and this could potentially make your hair thinner down the line. From what you’ve read above, you would have probably thought that hot showers might actually help acne. Since they dry your skin out a little, it could have potentially stopped your pores from containing so much oily bacteria. Well, the opposite is actually true. Warm water is a yes, but hot water is a no. 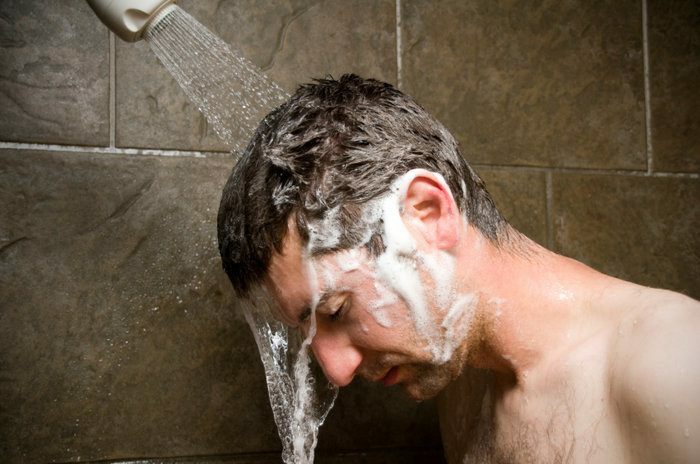 If your showers are too hot, this can often aggravate acne and cause it to spread! Other than dangers to your physical health, one of the main reasons to stop taking hot showers, is simply because they are too comfortable. You’ve landed on this page because you want to become better, whether you know it yet or not. Hot showers are too comfortable, and if you get used to this comfort, it’ll be tougher for you to go after your goals. Much like the reasons to stop watching television, or stop eating sugar; these are all addictions. And when you rely on an easy addiction that keeps you comfortable, you’ll find it much harder to live to your fullest potential. Your success starts with your daily routine, and if your routine is full of habits that are easy, and don’t benefit you in any way, you have a problem. Here’s the thing, you love to take hot showers right? And when you love to do something, you want to do more of it. Which means that your time spent in the shower increases. Instead of having a 2 minute cold shower, you’re having a 15 minute hot shower. 13 minutes, gone… just like that. Now imagine if you’re doing this for more than just one activity throughout the day. How many minutes are you really wasting here? You’d be surprised at how much time you can claw back from taking the hard way. Are you trying to stop taking hot showers? Leave a comment below. Cold showers for the win Ewen! Damn! i love hot showers. It’s as addictive and pleasant as my morning black coffee. But, from now on, cold shower it is.